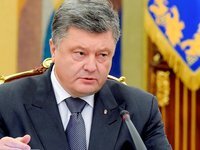 President Petro Poroshenko of Ukraine has said it is important to raise the efficiency of the activities of the Ukrainian maritime economic complex for the development of Ukraine's economy and said there is a need to introduce new models in its activities that would be able to secure the current volume of maritime transit through Ukraine. Speaking at a meeting devoted to the development of Ukraine's maritime economic complex in Izmail, Odesa region, on Tuesday, the Ukrainian head of state said that despite Russia's aggression Ukraine has remained a maritime transit nation. "I am optimistic about the restoration of trade turnover between Izmail and Reni, including the one through free economic zones," he said. "We need effective models that would enhance Ukraine's status both as a transit and maritime nation," Poroshenko said.